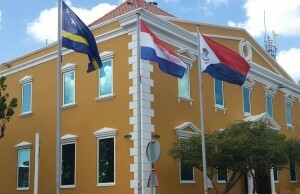 WILLEMSTAD - The Office of the Attorney General (PPG) will not give instructions to the Investigation Team Curaçao to carry out a further investigation following a complaint against the former President of Parliament Humphrey Davelaar. The complaint was filed on January 10 by the so-called group of nine, who are the opposition MPs. The prosecution considers the use of criminal law is not necessary at this time. This is stated in a response from the prosecution to the group of nine. The opposition MPs argue in their complaint that the manner in which the vacant seats in parliament were filled after a number of MPs have accepted ministerial posts, did not proceed according to the rules and regulations. This is also the reason why the documents which were made during this procedure should be considered false. Davelaar, therefore, is guilty of forgery which is a serious criminal offence, says the group of nine. However, the Public Prosecutor considers that the position of the opposition MPs should be the topic of democratic debate in Parliament. One possible outcome of the debate, according to the prosecutor, that more detailed rules can be presented on the procedures. Parliament can also agree on the interpretation of the current rules. The use of this legal means will polarise rather than stimulate this debate and the prosecution will, therefore, exercise the utmost restrained before the criminal law is used.